To get a good sear on the meat, have your pan very hot before you add the meat. If flank steak isn’t available, skirt steak will work just fine. Preheat the oven to 450 degrees F. Toss the celery, 1 teaspoon olive oil, and salt and pepper to taste on a foil-lined rimmed baking sheet; roast until tender, about 20 minutes. Whisk the mayonnaise, 2 teaspoons olive oil, lime juice, Splenda, hot sauce and 1 tablespoon water in a large bowl. Add the roasted celery and toss. Add the lettuce and watercress but don’t toss. Heat a large grill pan or cast-iron skillet over high heat. Rub the steak with the remaining 1 teaspoon olive oil and season with salt and pepper. When the pan is very hot, add the steak and cook, undisturbed, about 3 to 4 minutes per side for medium rare. Transfer to a cutting board. Add the scallions to the pan and cook until charred, about 2 minutes per side. Slice the steak against the grain. Add the steak and tomatoes to the bowl with the salad and toss to coat. Divide among plates. 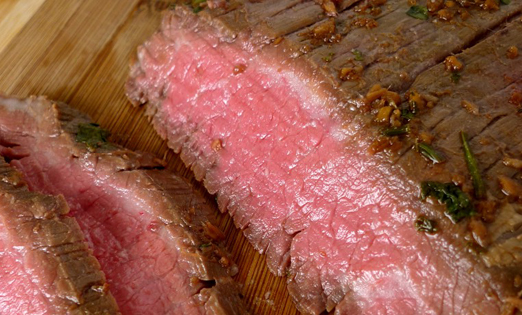 This entry was posted in Beef, Entrees, Metabolic Medical Center Recipes, Modified Profast (Fast and Flexible) Recipes, Salad and tagged celery, flank steak, marinade by foodies4mmc. Bookmark the permalink.